Interdisciplinary visual artist Meagan Musseau of Newfoundland and Labrador has been selected to conduct the 2018 Emerging Atlantic Canada Artist Residency in Banff. 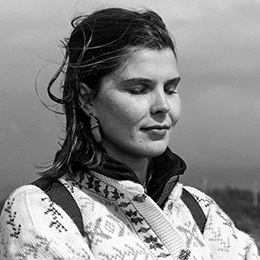 Meagan Musseau is an interdisciplinary visual artist of Mi'kmaq and French ancestry from the community of Curling in the Bay of Islands, Newfoundland and Labrador––Elamstukwek, Ktaqmkuk territory of Mi'kma'ki. She works with customary art practices and new media to explore the relationship between land and body, object and narrative. Musseau graduated with a BFA in Visual Art from Grenfell Campus Memorial University of Newfoundland and Labrador. Her work has shown nationally and abroad, in venues such as FLUX Media Art Gallery, Victoria; Open Space Artist-Run Centre, Victoria; Campbell River Art Gallery, Campbell River; U of S Gallery Two, Saskatoon; Eastern Edge Gallery, St. John's; Grenfell Art Gallery, Corner Brook; and University of Brighton Gallery, England. Musseau was a member of the Indigenous Emerging Artist Program 2015-16 on unceded Coast Salish territory and has participated in artist residencies at Banff Centre for Arts and Creativity, Alberta; Centre for Book and Paper Arts, Columbia College Chicago, Illinois, United States; University of Brighton Fine Art Printmaking, Brighton, England; and the National Artist Program, 2011 Canada Games, Halifax, Nova Scotia.